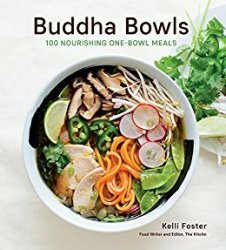 Buddha bowls, occasionally called “bliss bowls,” “nourish bowls,” or “power bowls,” are the ultimate in one-dish meals. You start with a base of whole grains, rice, noodles, or legumes. Then you layer on a generous assortment of cooked or raw vegetables. Finally, you top the veggies with a boost of protein and then a dressing, sauce, or broth. Buddha bowls are an easy, healthy meal that can be ready in minutes and that you can have for breakfast, lunch, or dinner--or, if you like, all three! The Buddha bowl concept is loosely based on guidance from Chinese medicine: a meal should have vegetables, protein, and grain. Typically, in a Buddha bowl there is a high ratio of ingredients to broth or sauce and the ingredients are left whole or in large pieces, and not blended, minced, or pureed. Although it is Asian in inspiration, a Buddha bowl can be made with a variety of ingredients from just about anywhere on the planet. Kelli Foster, who writes about food for the popular website The Kitchn, serves up in these pages an amazing variety of Buddha bowl ideas, each one vibrant with color, alive with flavor, and oh-so-comforting to eat. Can you think of a heartier way to start the day than with a Blackberry Millet Breakfast Bowl, a Coconut Quinoa Breakfast Bowl, or a Chai-Spiced Multigrain Porridge Bowl, just three among many breakfast bowl ideas? Later in the day, for cozy meals with loved ones, how about Warm Autumn Chicken and Wild Rice Bowls, Sesame Tuna Bowls, or Lamb Kebab Bowls? For company, Lentil and Smoked Salmon Nicoise Bowls or Miso Noodle Bowls with Stir-Fried Beef will delight your guests. There are many vegan recipes, too, from Cauliflower Falafel Power Bowls to Spicy Sesame Tofu and Rice Bowls and beyond. A special chapter on fruit bowls has ideas for power-snacking as well as for meals. Buddha bowls are elegant in appearance and flavor but surprisingly easy to make--a perfect marriage of convenience and good taste. If have not done so already, you should give them a try.